10/23/15 – Update v5.9 Calculator, Vector Color Changes & Promoted Player Improvements! Happy Halloween (at least in a week), so you will see the halloween images on the main menu. This week we have a brand new, working calculator in the Tools folder! We’re going back old school here. Another requested feature is being able to change colors when drawing, so the Vector Tool has gotten even better with this update! The nice thing is that you have even more colors to choose from than the standard 8, just choose from the color wheel and you’re good to go. Promoted players can now load up their own Game saves and Workshop mods, which means they can do almost everything the host can do other than player administration! There are all kinds of great improvements and fixes in this update, so please read on below to see everything. Enjoy! 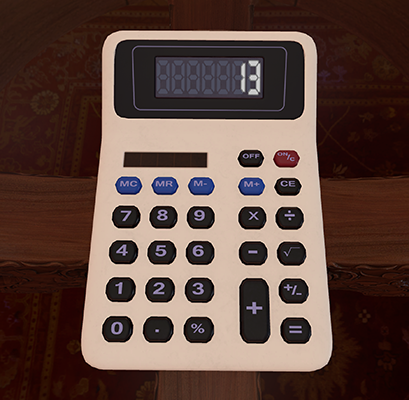 Added a realistic “old school” style calculator for all your calculating enjoyment. Works just as you expect with all buttons functioning. You can find this in the Chest -> “Tools” folder or the “Tools” game mode. Added Steam avatar icons next to names on top left. Clicking the Steam portrait will bring up the overlay to view their profile. This makes it easy to add players to your friend’s list. Improved setup by enlarging the table and fixing spacing for a more comfortable feel. Blue ships have been tinted a little lighter. Updated table graphic to be more centered and the text slightly faded. Space background and loaded alphabetized cards will be coming in the future. Expansions will also be coming in the future. 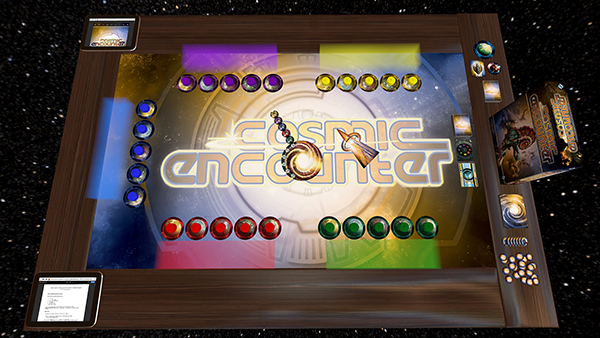 Cosmic Encounter buy page has been added to our website. You can now change the color of your vector drawing tool. You no longer have to change your seat to get a new color. 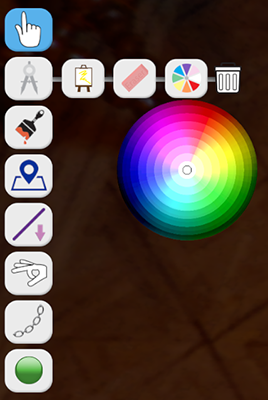 A new color wheel will show up when you hover over the Vector menu item. Promoted players can now load and save Workshop and Game files. Promoted players have access to almost all host functionality besides player administration. The host can promote a player by clicking on their name and selecting “promote”. Clamp size of object now fits to the screen. Alt zoom size is consistent across all camera distances. Fixed objects clipping off the screen. Fixed objects slightly changing size when mousing over them. Held objects now rotate around a pivot point instead of their position, so tokens placed on a card for example will remain in the proper spot when rotated. If you wish to spin multiple objects in place then rotate them while not holding. Flipping and rotating when not holding them objects will ignore collision allowing you to flip a mat and keep the pieces on top. Improved the smoothness of manipulating objects that you aren’t holding. Object can be picked up with slight tilts to their axis which fixes some collisions issues. Fixed a lot of clipping issues when grabbing a group of objects that are overlapping one another. Fixed height variation when holding objects at strange angles. Added new “Tools” menu in the Chest to separate some objects in the Misc folder. Icons have been added to the Control Scheme for the controllers and keyboard. Separate sliders for Music and the Mp3 have been added, so you can differentiate between the main menu music and the Mp3 Player. In the Host Permissions, there is a new “Digital” checkbox in which the host can enable/disable all of the digital items from interaction. When the Table Flip host option is unchecked, the button on the top will be grayed out. If the game is set to “None” when a save is loaded it will now use the name of the save file in the Server Browser. Improved Digital Counter when holding down plus and minus. Box selection cap has been raised to 64 objects. Objects smoothly move into a bag when dropped on it. Improved distance checks for certain actions like right click and pan camera. Improved Local File Support – You can now place files in Image and Models folder and directly reference them by name and extension. You can read more about this in our Knowledge Base. NOTE: This will not work in online play unless the players are manually given these new files. Fixed issue when stacking two pieces together, one with auto raise and one without causing bottom piece to go flying when picked up. Fixed issue with objects clipping into the table when you hold and flip them. Fixed color tint not sticking when objects are stacked. Fixed some issues Steam portrait not working correctly. Fixed issue with bags being able to go inside themselves when dropping multiple objects. Fixed issue with hover highlight not working on named tooltips consistently. Fixed issue with Controller camera / mouse being stuck moving (HOPEFULLY). Fixed tablet washing out at certain angles. Fixed potential save issue with objects flying to a destination like dealing. Fixed grabbing not working on all selected objects when sticky grabs objects. Fixed issue with deselecting not working correctly when grabbing a non selected stack. Discuss this post on the forums!